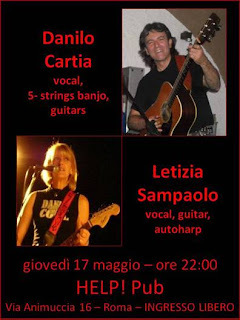 Banjoist, guitarist, singer, and bandleader Danilo Cartia (I) announces that he and Letizia Sampaolo (vocals, guitar, autoharp) will be playing at the HELP! Pub, Via Animuccia 16, Rome, Italy, on Thursday 17 May from 22:00. Admission is free.